Demand for the iPad has been huge and you don’t need the studies to see it - shipping times for the third-gen iPad have slipped to a couple of weeks, and it’s only been a few days since Apple unveiled the tablet. Apple has also confirmed the obvious: iPad demand is “off the charts,” Cupertino said for USA Today. But while this says a lot about general demand, what about the new iPad’s success with corporate clients? A new ChangeWave Research study of “1,604 business IT buyers” revealed that 22% of the companies have decided to streamline productivity by buying tablets. 84% of those companies are planning on getting the iPad within the next 90 days. Samsung-made Android tablets and the Kindle Fire only managed to get marginal piece of the pie with 8% and 6% respectively. “Among the competitors, Samsung (8%) is down 2-pts and continues to remain a distant second in planned tablet buying… Other tablet manufacturers showing a decline in corporate tablet share since the previous survey include H-P (4%; down 1-pt), Asus (3%; down 1-pt), Dell (3%; down 2-pts), and RIM/Blackberry (3%; down 2-pts),” the study explains. Corporate interest in the iPad is at record levels as even after the iPad 2 launch it was “only” around 80%, and now it’s even higher. 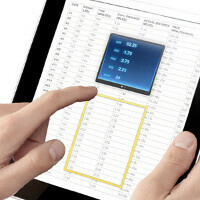 A similar analysis by The Business Journal saw iPad usage growing four-fold among small business last year. Another Apple article tellin' the same thing. Of course, demand for the new iPad is gonna be sky-high. No doubt about it. Afterall, it's a resolutionary product of the most "innovative" company! I think the point was to show how lots of businesses are starting to attempt to increase productivity by purchasing and using tablets, which is really cool. I think this is what tablets are great for! I really don't see why! I have an iPad2. It's good device, but it's not a productivity tool! Smart businesses will hold out for a 3G/4G capable Android Transformer or Windows 8 Transformer type devices. It just makes more business sense to be able to connect a mouse/memory stick and have a decent keypad with a "tab" button for example. Surprising that these companies would list the Samsung Android tabs as their preferred alternative to the iPad than an Asus Prime. Shows that the market's focus is overwhelmingly fixed on the iPad and is unaware of what the current superior Android tablet is. God pre ordered the Apple iPad 3...and had to go on a waiting list. It says mines gonna ship on 19th,what's your date? 84% of the 22% of the1600 of IT buyers that will streamline is not huge demand! There is huge demand for the iPad but this survey does not point to that demand. That means 295 out of 352 companies are gonna get ipads! Still huge demand, but I agree with pointing out the 84% or 22% fine print. By the title of this article, one might assume 84% of all business IT buyers are planning on buying the iPad, because that is exactly what the title says. In reality, only 22% of business IT buyers are planning on buying tablets, and 84% of those individuals are choosing the iPad. In short, the number in the title should be less than 19%, at least if the goal were accuracy and not sensationalism. i think the businessmen need simple OS and very rich app store..